The developer of Just Cause 2 had, at one point,been in negotiations with LucasArts to make an open world game in the Star Wars universe. 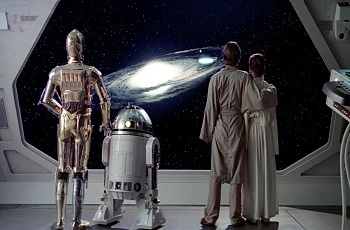 The Star Wars the universe itself is a massive one, and a dream title for many Star Wars devotees would be an open world experience that would equip them with the tools and freedom to search out every nook and cranny of its wide and diverse world. While previous Star Wars games have shown us some of the galaxy's more exotic vistas, none have arguably ever given gamers the sort of freedom typically offered by open world titles. It's been revealed, however, that such a game, at one point, almost existed. According Oskar Burman, former studio manager for Avalanche, the developer had, between 2005 and 2009, been in talks with LucasArts to develop a "massive, open-world" Star Wars games. "[A] long time ago, in a galaxy far, far away, we almost got that deal when I was at Avalanche," said Burman. The developer of Just Cause 2 , Avalanche would arguably have been a perfect fit for such a project. Avalanche founder Christopher Sundberg expressed has little doubt the project would have been a hit. "If they had given us the deal back then LucasArts would be alive today," said Sundberg. "A massive SW open world game! We would have rocked it." While it's unclear if a successful open world Star Wars game would have saved LucasArts following its sale to Disney, it nonetheless might have done more for the company's legacy than Star Wars Kinect, the last game produced by the now defunct publisher. Currently, the future for Star Wars games is somewhat unclear. Most recently, Disney signed an exclusive licensing agreement with Electronic Arts, and while the involvement of studios like Bioware, DICE and Visceral give hope for quality products, there's still a lot of mystery as to what games the partnership will produce.